Hamish MacGregor and The Blue Bonnets "Trip To Scotland"
We recently talked with Simon Thoumire about this Scottish guy we have never before heard of: Hamish MacGregor. It seemed to us that Simon has high respect for Hamish, but he pointed out that he will never play together with him on stage. Well Simon made us curious what Hamish's music sounds like. And just a short time after that we received this review copy of Hamish MacGregor's first album - what a coincidence! This CD has as second title '30 Great Tunes with Place Names' - and this is concept: In 13 sets of tunes you hear thirty well-known and quite unknown traditional tunes - from 'Flowers of Edinburgh' and 'Loch Lomond' over ' Roslin Castle' and 'Stirling Castle' to 'Inverness Gathering' and 'Spottiskerry'. In the booklet you find a map with all the places the tunes are about - but not much more. You cannot find any information on who The Blue Bonnets are, what instruments Hamish plays whatever. You just find out that Hamish is Producer and Arranger, and that the music is played by the Blue Bonnets; and the recording was made in the Livingroom Studios in Edinburgh. But now to the music. 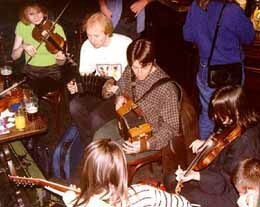 The instrumentation is - as far as we hear - fiddle, piano, small pipes, tin whistle and sometimes concertina. The music is partly unspectacular, but there are also several superb moments on the album. Nevertheless - who are these guys playing this Scottish music? Now if I tell you that Hamish MacGregor was a BBC Young Tradition Award Winner, as well as was one of the Blue Bonnets - I am sure you won't believe me. But it is true! Now imagine - just imagine - Hamish MacGregor's real name would be Simon Thoumire, and The Blue Bonnets would be Jennifer and Hazel Wrigley and Simons girlfriend. Then this would be the creme of Scottish music? Well I am sure if you have the CD in your hands you will not believe me - you find no word of Simon Thoumire or Jenny or Hazel Wrigley. No that would not be clever or would it? If you ask Simon about this CD he will tell you "It's fiddle and pipes" - and if you ask him if he is Hamish MacGregor, I am sure he will just laugh. So it'S up to you what you believe! As Simon told us, this CD is aimed on the touristic market, and up to now it has had quite good sales. These tourists will never know that they have bought a Simon Thoumire album! Next album planned on Simon's label Tartan Tapes is the Hamish MacGregor Pipe Band - with Hamish playing on five different pipes. We are curious about this new venture. By the way: It's clear that the information in this just stays between me and you isn't it? Don't tell anybody who Hamish MacGregor normally is. Psssssst!!!! Oyster Band "Deep Dark Ocean"
Label: Cooking Vinyl, CD128 These "Oysters" have always been on the raw side - an English band playing folkish rock with an urban, punk-influenced edge. "Deep Dark Ocean" therefore comes as something of a surprise. The word "mellow" even comes to mind, as the band winds back the roughness and comes out with some more accessible, melodic material. It's not that they've gone soft - there's still plenty of anger in their lyrics, and the bass, drums and guitar still growl and rumble as before. But the fiddle, melodeon and an occasional bit of cello rise to the surface on tracks like "Native Son", and the positively sunny "Sail On By". There's even a gospel/country feel to "Not Like Jordan", though the effect is probably for irony as much as anything. Other songs either have nautical themes or a shanty jaunt to them, giving a salty tang to the whole album. At times it even had me reminiscing about middle-era Steeleye Span. Of course John Jones' voice is a mile from Maddy Prior's. And the Oysters maintain that determined north English toughness. But when in "No Reason to Cry" they sing "we make a mess of tenderness", why am I not totally convinced? Label: Do Fol/Boa; DF002; Playing time: 50.20 min The debut album of one of the most popular bands from Galicia/Northern Spain of these days. The six young men of this special band play a nice selection of Galician, Celtic and modern instruments, like gaita, fiddle, accordion, Celtic harp, percussion and sax. Their instrumentals - partly composed by Berroguëtto's Anxo Pintos, partly traditional - sound wonderfully fresh and beautiful, giving space for all of the musicians. And these instrumentals would be already enough for a magnificent album, but there is an additional bonbon making up my personal highlights of the album: The boys are joined for four songs by Pandereteiras singers. These female singers present another typical Galician tradition; they sing with very strong, loud voices, giving a very emotional, exciting and full sound. In this case, the Pandereteiras singers are seven girls doing a very good job. No wonder that this CD is said to be the most exciting Galician album since years. Label: Cooking Vinyl; COOKCD123; Playing time: 50.13 min Belfast singer/songwriter Andy White performs on this album twelve of his own songs, all in a sympathetic catchy manner. The lyrics are mostly about teenage feelings, and from personal points of view. It's more of a rock than a folk backing, but it is very enjoyable listening. Simply very good singer/songwriter rootsrockpop. And a nice guy he is too. Label: Amorique Musik (has closed down recently; but still available from Touchwood); Armor 8430; Playing time: 48.35 min A German and an Irish female singer, both based in Berlin, have joined for this exciting duo. Cristina Crawley and Kerstin Blodig both have beautiful voices, and they love to experiment with special vocal harmonies. The repertoire of them is based on Irish material, but they have written themselves also a few nice songs. You can find on this CD some unusual versions of well-known songs with superb harmony singing - some of them maybe even too unusual and experimental. There is a fresh sounding 'swing' version of Star of the County Down as well as an experimental version of As I roved out, called here One Night Stand and including modern bluesy mouth music. The duo itself plays quite a range of instruments, like guitar, mandolin, fiddle, whistle and percussion, and on this album they are joined by several guests, like Kerstins Norland Wind colleagues Thomas Loefke (harp) and Ian Melrose (dobro, low whistle), Limerick Junction's uilleann piper Johannes Schiefner and step dancer Bronagh Crawley. These are two highly talented singers, presenting here a very enjoyable though sometimes vocally a bit too experimental album with loads of beautiful vocal harmonies. Telynor "Off the beaten Track - an album of Christmas music"
If your family (or you yourself) does not want to miss listening to Christmas songs under the tree, get this one - it is much more enjoyable than the stuff available in the shops! Label: Greentrax Recordings; CDTRAX143; Playing time: 50.11 min We are great admirers of Deaf Shepherd since we have first seen them two-and-a-half years ago at Stonehaven Folk Festival. So you can imagine our pleasure when Santa Claus (or was it the postman?!) brought with his big bag of letters their second album, "Synergy". Deaf Shepherd are one of the livliest bands on the Scottish scene, their youthful energy just blows you away - they are one of those bands showing that you need just an acoustic instrumentarium (no drums, no electric instruments) to make crowds wild. Do not think that they have just up tempo numbers - they know very well when to have a beautiful slow tune or a haunting ballad. Definitely one of Scotlands best bands, and also definitely one of the best new albums of 1997. Their second album shows them again at the height of their talents. Now a five piece band with two female fiddlers and the boys on up to two pipes, guitars, whistle and bouzouki, they are joined for the album by the producer of the CD, Tony McManus, and Anam's Brian O'hEadhra both on bodhran. Deaf Shepherd's former bodhran player and founder member of the band Angus McLaughlin has left recently the band. John Morran sings on "Synergy" five beautiful and tastefully arranged songs in Scots, including Robert Burns' Winter o' Life and a special version of the traditional "The Coarncraik". The other 7 pieces are sets of cracking wild and beautiful slow tunes, some of them composed by Deaf Shepherd's Rory Campbell, being one of Scotlands best pipers and pipe tune composers. You can now hope that Father Christmas brings to you that lovely present that Santa Claus brought to us - and if you do not want to risk that again there is just the ugly tie for you under the tree (as always), then go to your local record shop and safe your copy of "Synergy". And thinking already of the new year - make sure that you catch Deaf Shepherd in live; or even better: book them for your club! Label: Akku Disc; ADCD3029 The new CD "Stelle Splendens" of the German band Adaro is experimental and is not easy to classify. The booklet promises medieval, religious songs from 13th century Spain. However Adaro found their own peculiar style, combining early music with modern elements. The four Germans call their style "medieval crossover". Adaro play traditional instruments like hurdy gurdy, Hümmelchen (German bagpipes) and flutes, but they use also keyboards, drum computers and e-guitars. Synthesizer effects and electronic percussion are used in many of the fiftteen songs of the CD - that may cause a shedder for some fans of pure medieval music. Long flute solos and the clear voice of singer Konstanze Kulinsky indemnify fans of handmade early music for the pieces of music produced "by socket". Altogether "Stelle Splendens" is a CD that fits equally into the section of medieval music, new age, electro-experimental music and folk. Wendy Mac Isaac "That's what you get"
Label: KRL/Lochshore Records; CDLDL 1266; Playing time: 63.53 min Wendy Mac Isaac is a 26 year old Canadian from Nova Scotia - and she plays the fiddle, like so many people from Nova Scotia. She has a fresh, relaxed way to play, sometimes also quite agressive, and the style is very much Cape Breton. She is backed by some very good musicians on guitar, piano (most time by her cousin the quite famous fiddler/piano player/step dancer Ashly Mac Isaac), a bit of percussion and drums and of course feet and some set dancers.The album features 12 sets of tunes, most of them traditional. 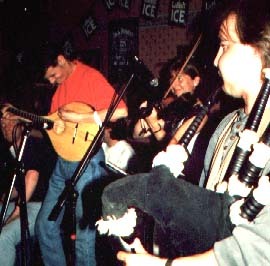 Lochshore is Scottish label discovering new celtic musicians from easter Canada - bringing a new wave of enthusiasm to Europe. Label: Xource; XOUCD 118; Spielzeit: 46.52 min Väsen might be filed under Swedish trance-trad music. The approach of this quartett reminds me of other instrumental folk trance bands like Germany's Hoelderlin Express or Scotland's Shooglenifty - but Väsen have found their very own style. Being now one of the representants of the Swedish folk scene, Väsen have in percussionist Andre Ferrari a new (the fourth) force joining nyckelharpa/swedish keyed fiddle (Olov Johansson) guitar (Roger Tallroth) and viola (Mikael Marin). On this album for the first time all the exciting and experimental instrumentals are written and composed by members of the band. Influences in their music are as diverse as jazz and rock but the Swedish traditional element is always evident. A extraordinary talented and energetic band, definetly to watch out for!